Glad to know my boy is learning the meaning of Thanksgiving… He is thankful for monster trucks! My daughter was so exited about the election, and there were numerous school activities feeding the frenzy. Looking at schoolwork that was sent home last week, I discovered a gem of a writing example. 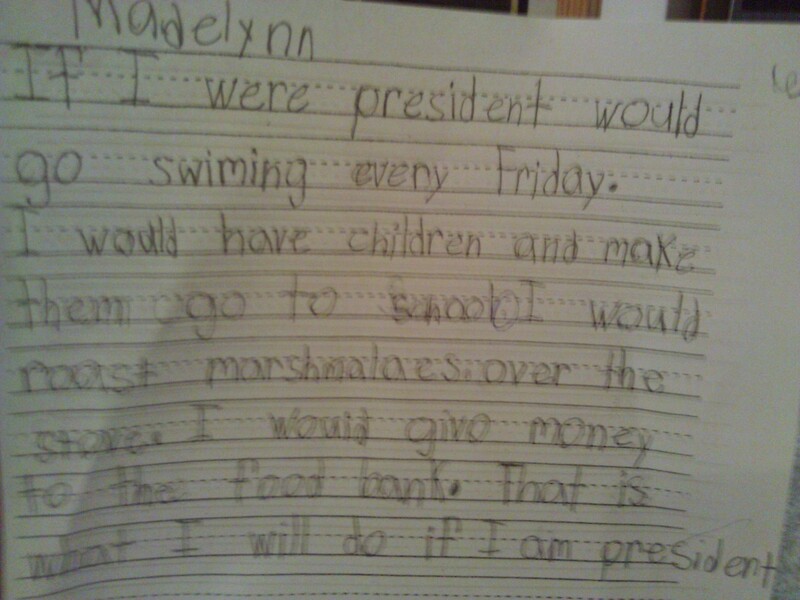 So in other words, if she were president, she would be JUST LIKE ME. So cute! We had a little talk on how she could definitely do all of that, but she didn’t need to be president to do so. You’re probably wondering about roasting marshmallows over the stove… I got this idea after a camping trip when I was single. I was craving roasted marshmallows, and started roasting them over the stove rather regularly. Anyway, I recently introduced the kids to this idea, and we save the marshmallows for a special occasion — when she gets 100% on a spelling test we celebrate by making s’mores. Her latest pursuit is making cards like the nuns, and she wants to sell them to make money. Thanks to that kid note, I’ve encouraged her to give a portion of her proceeds to the food bank. Of course so far, I seem to be the only buyer of these cards! Remember that video interview I mentioned a few weeks ago? Thank goodness they didn’t use my really brainless responses! Here is a link to the video. Oh, she’s ready! I thought. Over the course of the next weekend, whenever we got a chance when the boys in our house weren’t around, we watched it. I sang along. It was such a special memory. I remembered watching that movie each year with my own mother, and I was thrilled that my daughter seemed to like it and understand the story. It is adorable. But it is getting to the point of her being obsessed. 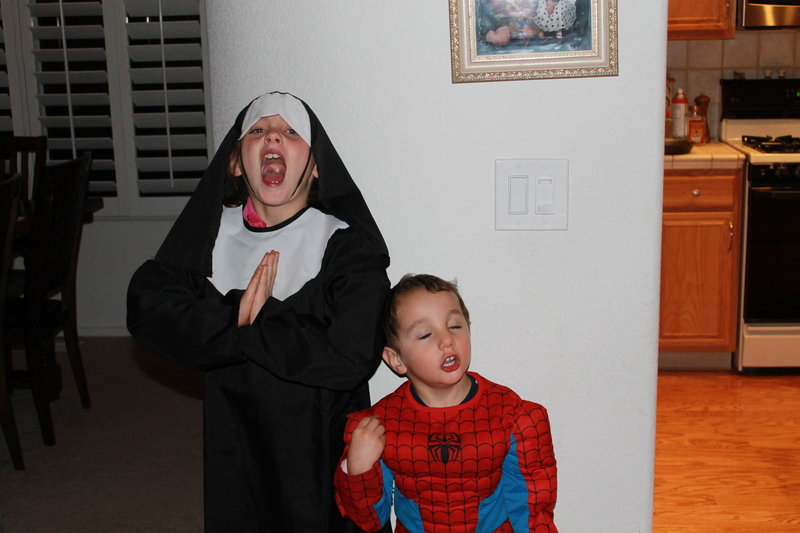 She quickly decided she wanted to be a nun for Halloween, despite the fact that I told her most of her classmates wouldn’t even know what a nun was. She then started talking about wanting to be a nun when she grew up. She has watched the movie so much that she can recite all of the dialogue and songs by heart. So last week, when I saw a mention in the newspaper about the nuns at a local monastery having an open house , I just knew we had to go. Once I told her that I had a six year old entranced with nuns that just wanted to meet some real live nuns, the doors were thrown wide open and we were offered a personal tour of the entire facility. You should see the kitchen these nuns have. Holy cow, it is huge, with modern appliances, granite countertops, and I can just imagine the amazing meals that get created in their kitchen. They have a dining room with a big, beautiful table, where all 19 nuns eat together with a huge picture window backdrop. I really wanted to join them for a meal. As for the nuns, we met a lot of them, and they were so nice, open and receptive. It literally felt like 19 girlfriends living together, which as I contemplate that, actually sounds like a pretty sweet life. I wonder if they drink wine, though. I described to my husband as a sorority house for older women (without the men and alcohol). Anyway, we spent a lot of time touring the grounds, and Little Miss even asked to see their bedrooms, so we were ushered up to the living quarters to see their bedrooms and meet their dog that they keep onsite. I then learned that the nun giving the tour was an avid skier. A skiing nun! How cool is that?! We definitely bonded over skiing, and she told me that she skis almost every day in the winter. (Once again, wow, not a bad life, eh?!) It makes sense, though. Living in this community, skiing would be a great way to do outreach, as you can talk to people on each chairlift ride. They have a few nuns on site that are resident artists. We stopped in to view the nun’s art and buy some greeting cards that the nuns had made, and as we were leaving, I asked my daughter if she still wanted to be a nun, and she enthusiastically said yes. “But then you couldn’t have children,” I reminded her. Looks like she has her long term career objectives all planned out. She’ll be a nun that works at an orphanage, and does art, gymnastics, skiing and ballet in her spare time. Looks like a perfect future nun, right?! Phew, what a weekend! I have been on a baking frenzy. I love pumpkin. I am obsessed with pumpkin. One of the reasons I love Fall is because of all of the pumpkin baking it inspires. Yesterday, we started out with pumpkin pancakes. I have honed this recipe until I believe it is perfect (see below). Then, I made pumpkin chili, and baked the Halloween pumpkins, roasting cinnamon sugar pumpkin seeds (with coconut oil and coconut sugar) at the same time. Once I made fresh pumpkin puree, I made a raw pumpkin pie (YUM), and this morning, while sipping my pumpkin spice latte, I baked up some pumpkin bread. I have been baking this recipe for years, and think I finally honed it to perfection as well (see below). While the pumpkin bread was baking, I remembered I had volunteered to take snacks to Girl Scouts tomorrow, so I baked up some healthy chocolate donuts for the girls (because the only thing I love more than pumpkin is CHOCOLATE). Perhaps I missed my calling. Baking and cooking healthy meals with REAL and healthy ingredients for my family gives me such a natural high. I feel like an artist, and when you cook with real food, the dishes are so colorful and beautiful. Add 4 eggs, 1/2 cup whole wheat flour, 2 t baking powder, 1/2 t salt, 1/4 c flax meal, 1/2 c pumpkin puree, and a generous shaking of pumpkin pie spice. Serve with real maple syrup, fruit and whipped cream on top. Mix all ingredients well and bake at 350 degrees for 40 minutes.